This is really interesting, specifically in relation to Benjamin’s ‘Work of Art…” essay. I’m in agreement with your criticism of Latour here. More on this when I have more time. Look forward to any thoughts you may come up with. If you’ve seen the Latour essay (linked, in the link above), he does address Benjamin’s essay directly, and proposes several criteria by which to make Benjamin’s point more clear (if I recall, he accuses Benjamin of some kind of mystification). Unforunately I can’t open the Latour PDF on my browser, but I have read WoAitAoMR literally dozens of times and written far too many papers on it, and what it seems Latour is saying about copiousness here just makes no sense to me. There are plenty of unoriginal works and images that get reprinted over and over and over ad nauseum. Especially in our society, all the image needs is some sexual grotesquery or a celebrity’s face on it and it will be plastered everywhere. How many gallery exhibitions have I been to that featured photorealistic paintings of Paris Hilton? Too many. Was Latour responding to Baudrillard on the copy/original, or is the essay specifically about Benjamin? Too bad it won’t open for you. He is focused a bit on Benjamin, but is really mostly concerned with the specific two examples of painted art copies, and makes some comparison to the copies of theatrical production. My critique gives much of the flavor of it, which some lengthy quotation. Kvond: I think that Latour speaks to this. He argues that the very sense of that something is “original” comes from the pressure of the numericity and variability of copies produced. In a kind of retroactive passage, the copies of something press down upon their origin and give it an aura. In this way, a fan of Britney Spears would quake with pleasure when meeting the “original” who had given spawn to so many copies of herself, much as an artlover would love to come in contact with the “original” Mona Lisa. I agree a great deal of this aspect of his argument. I love this. As you probably know from prior posts of mine I’m suspicious of many of the ways the past is deployed for current purposes, or rather, I think we normally use the past to myth with. But this sense you’re working with of the past layered into the present looks to me like a nice middle ground between the various mything strategies. Sorry that last one was so rushed, I had to run to a meeting. Again, I like the idea of nexus points and copious states. My own metaphor of layering may not be the best one here because it’s too static. And the language of causation is only slightly better. What actually happens, I think, is that history creates in each object reflective / deflective / absorbtive surfaces in at least two ways – first, through a process of deposition in which the shapes and angles of each new encrustation are highly sensitive to the ones that came before, their particular orientation in the particular encounter, and the surrounding conditions. Second, through a simultaneous process of carving grooves and ridges, so to speak. All of this is highly dynamic, although it’s also the case that old surfaces get buried and remain durably albeit not linearly constitutive of the emergent shape of the whole, and that therefore it seems like there is an essence of the object withdrawn from interaction effects. Originality does emerge from this process, because the inputs are contingent and because their accretion / interaction is so dependent on variables of timing, environment and so on. There’s nothing whatsoever original about the components of the object, only their configurations and the way they turn their surfaces to new interaction. So Britney Spears is going to be much more important and auratic for people who’ve never come into contact with the objects of which she is herself a copy; but even as a copy of them she is unique. Kvond: I don’t have time until Wedensday to look at this, but I like your thoughts very much here. Off the top of my head, I wonder if you would say the same thing about let us say people who are unfamiliar with the tradition of Madonna and Child paintings, and the Madonna and Child Paintings of say Bellini. Is it that those that only know Bellini photographs, and don’t know the other prior Madonna and Child paintings would be most struck by its aura? I think there is some truth to this somehow (see the Mona Lisa). Yes! Thank you, I’ve been struggling to articulate this thought. Relevant history is known history (in an effective sense of knowing). If the antecedents aren’t known, it’s as if they don’t exist. Thanks for your thoughts here Carl. I’ll see if I can make some connections. Kvond: This sounds a little Bourdieu, I say this as a fan of Bourdieu. Kvond: This is very interesting. A problematic aspect of Spinoza’s philosophy, at least for me though it seems to trouble few Spinozists, is the way that he defines a body as a persistent ratio of motions and rest, leaves it almost arbitrary to decide what is an object persistent through time, and what is simply a series of closely related objects (occasionalism). With your metaphor of encrustation, something of this becomes more clear. If we think of objects that appear to persist amid change, there is a certain kind of “looking through” into them, a tunneling back, which makes us feel that there is an essence. For Spinoza this would be its essence, but that need not be decided for a non-Spinozist. Kvond: I had in mind something more particular, something that Latour seems to allude to, the way in which certain works of art, or perhaps great personages (or as Badiou could say, “events”) find themselves being copied in a profuse way, spreading their images as it were all throughout the future, like some sort of progeny, but also in such a way that each of the images is somehow judged by the original and all appear pale in one way or another (much as perhaps sons and descendants cannot live up to their father). Latour’s point is that this notion of originality actually comes retroactively, the greater the number (and perhaps diversity) of copies, they in a sense press down upon a central point, on the point of origin, and stamp it with an aura it didn’t have. So, all the photographic images of the mona lisa (and perhaps cultural copies in general) impress back upon the original painting, making it glow with a certain kind of fecundity. As a digression: I think that this is an aspect of Platonic thinking that some people really are mislead upon when they try to imagine what he is saying about forms. They want to see them as abstract and disconnected, when what he was seeing is something much closer to this notion of originality. Genus (kind, class) is also a “family” and is genetic. A genus is part of a fecundity. What I had in mind was the way that Medieval thinking would think in “types”. There were Christ-types that appeared through history, as a sort of powerful copy, but there were also allegorical types, ways in which events in the Bible populated present times, with a sort of informing fecundity. I was also thinking about how Giambattista Vico, when theorizing about the birth of language and the mental capacities of early man, wrote about “imaginative universals”. He felt that early humans necessarily thought “poetically” in metaphors and tropes. He claimed that when Ulysses was deemed as “the” allegorical form of a leader, when one encountered a leader, a real leader, one literally encountered a “Ulysses”. It is hard to say if this would be simply a different way of thinking that actually persisted, or if this is just an imaginative creation on Vico’s part. But he claimed that early poets, Homer specifically, was being highly literal, or at least realistic in his claims, and that listeners experienced the imaginative condensations as real (lacking the distinction between literal and metaphorical that we seem to have). 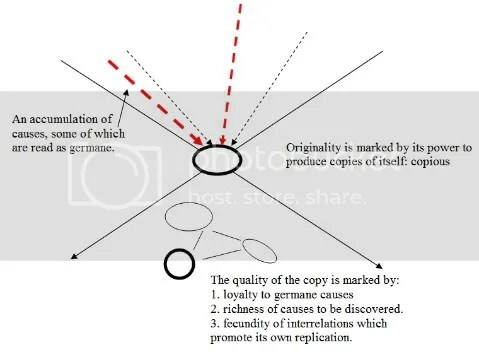 What occurs to me, due to Latour’s article, is that in cases of percieved originality, the way that copies impress themselves backwards in time, far from being removed from these seemingly archaic mentalities, they are right there before us (and they are not so archaic). What is suggestive about the diagram I posted above is that originality actually serves as a specific mode of past-perception, the “key-holing” of it (this seems to be where our ideas meet). This is one reason perhaps why historography can never been simply a neutral telling, a map-setting on flat ground. It is not just due to the limits of the narrative form (the need for temperal unfolding), but also that we need to see the very copiousness of copies via originary nexus events into which they are tied. Part of what I wanted to bring out is that it doesn’t all happen on this side of the mirror so to speak (where Latour concentrates his excellent explication). It is not just a case of “originals” being created via their copious progeny. But also that part of the reason why we trace this progeny back to a nexus that we fill with aura is that so condensed, in that nexus we also trace back influences, causal stories that make our present condition understandable. As we trace the germane causes that helped bring about a Leonardo da Vinci, or even a particular painting of his, we read not only continuity with those causes (those we find germane according to the narrative we assume), but also we treat the original as a kind of storehouse for additional causes, additional influences to be found, upon further investigation. In this sense, “the original” depending on its state, depending on its “originality” can become more fecund. This is why we museum our originals (not only artworks, and in buildings, but in an extraordinary variety of ways, including monuments to events, newreports, photographs of family members, relics from personal and public history). Someone might look through that keyhole as see something new, something more, which helps explain its productive influence upon our present and our future. Now you thoughts give me to think not only of these special cases of most obvious “originality”, great moments of art or history, but also if our everyday perceptions is like this, the affective way that we bond with events, objects and persons, keyholing them due to their copious influence either upon our personal lives, or our world. It is interesting to think that we already think in a medieval typology, or a genetic mythology, even in our everyday perceptions. And that this is not necessarily a bad thing, but rather part of the very way that the fabric of our doings is made. At best, if this is the case, perhaps we can make closer studies of this, choosing and tracing our originalies and their copies, their constructed causes (those we deem germane), with greater care. A keyhole-ology. A kleiology. In this way perhaps there are two kinds of auras we can speak of. To speak only in popular terms, there is what you spoke of in terms of Britney Spears, the near theophantic aura that strikes one if you have no experience of the past originalities of which she herself may be seen as a copy. She, or now Miley might practically float for a pre-teen. But then there is the kind of sense that comes from an educated historian makes, when for instance Magic Johnson becomes incomparable because of Connie Hawkins, Oscar Robinson or Pete Maravich. Or Obama, because of JFK or Lincoln. It seems that perhaps there is a dialectic between these two kinds of epiphanies, the way that events, persons, objects seem to eruptive which expressive and progenious power, and then the root-taking of that originality in the history of its own anticedents.